Special supplementary lens (spectra coating) for the Canon 1014XL-S and 814XL-S movie cameras for super wide-angle cinematography. When the camera is set to wide-angle macro filming and this lens is used, the focal lenght is fixed at slightly over 4mm, the shortest focal lenght in the world for 8mm movie camera. Because of this short focal lenght, the depth of field is so deep that, in good lighting conditions, there is no need for focus adjustment between the closest filming distance and infinity. As a result, you have the means to create many new and exciting effects in your movies. It can also be used on suitable 35 mm lenses also to achieve a 1.4 X increase in focal lenght (IE, 500 mm becomes 700mm with very low loss of light - about 1/3 stop or less). That’s what you can do to get a 500mm lens converted to a 700mm with a very small amount of light loss. A converter in the back will result in at least one and usually two stops of light lost. Of course, there is more flare to contend with and using a lens hood is critical to getting good images, but there are always tradeoffs to be made. Screw-in mount type, 67 mm thread. 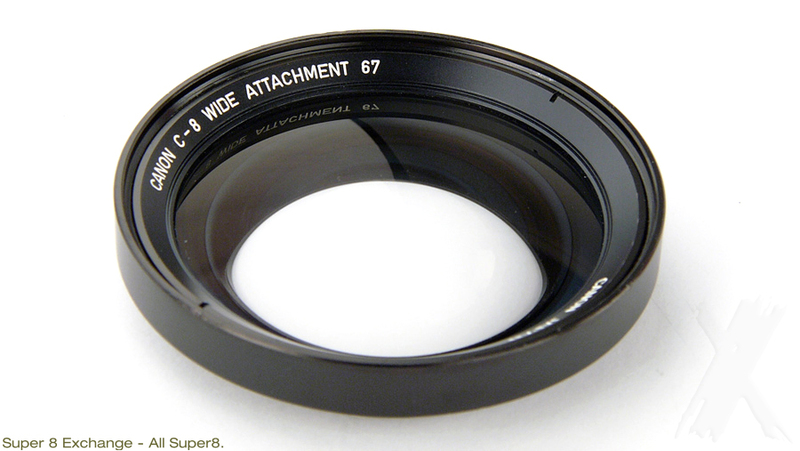 For 814 XL-S use the step up ring 62-67mm first. Comes with pictured accessories except the camera.